British Prime Minister Theresa May will be replaced in the next few days with a pro-Brexit leader, according to reports. 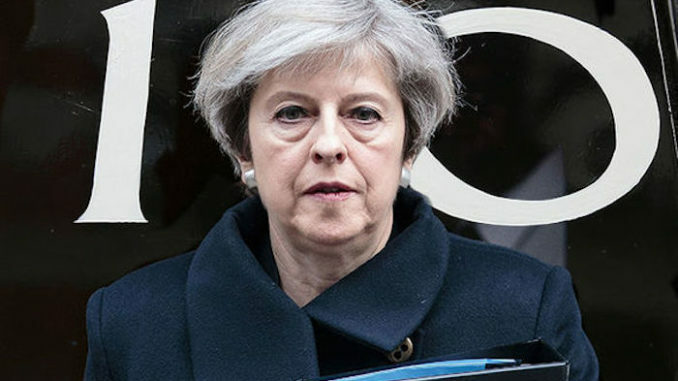 Members of her cabinet are preparing a coup to oust her, with The Sunday Times reporting that at least 11 cabinet ministers want her gone by Monday. Sky News reports: Her de facto deputy David Lidington has been named as her potential caretaker replacement, while several are said to be ready to throw their weight behind Michael Gove. Her former policy adviser George Freeman tweeted it was “all over for the PM”, adding: “She’s done her best. But across the country you can see the anger. Former education secretary Nicky Morgan told The Sunday Telegraph cabinet ministers should tell her “it’s time to go” while Steve Baker says potential leadership contenders should “act now”. According to Buzzfeed, the prime minister was told to think about leaving office by several of her whips during a meeting, but Mrs May was “unmoved”, refusing to believe it would make any difference to the deal. Writing in the Sunday Telegraph, former Brexit secretary David Davis said leaving on World Trade Organisation terms, also called a no-deal Brexit, looking “much better than the other options in front of us”. He said: “If parliament rejects the deal on offer, the prime minister has it in her power to deliver a WTO outcome. That is what she should do. It comes as up to one million people marched through London to demand a ‘People’s Vote’, calling for the deal to be put to the people with the option to remain in the European Union. She came under fire for a speech which blamed MPs for the impasse, saying “all MPs have been willing to say is what they don’t want”. She also acknowledged the “difficult job” all MPs face, and said it was not her intention to make it harder.